This is a normal peripheral blood smear. The red blood cells are normocytic with good hemoglobin content. A normal, segmented neutrophil is in the center of the picture. 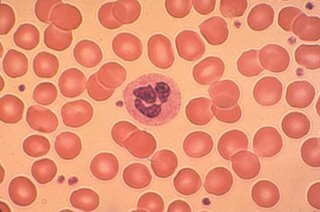 A normal platelet is to the immediate left of the neutrophil. Other normal platelets are scattered throughout the field. When you think of Steven - visualize this to be coursing through his veins! So today I go and read yet another updated CML board, find a link to a page that grabs my attention for the next few hours. This was a site about people that have advanced CML and cancer - all SO much worse off than Steven is. I read these stories that are mostly written by mothers of these children and young adults. I am humbled by the strength shown in these women and families dealing with such difficult situations. I am encouraged by so many of their stories, strengthened by their hopes and oh so glad that my personal black cloud of yesterday has passed by once again.